SUBHEAD: I brush a lock of hair from my face and catch the scent of the garden still on my fingertips. Image above: Artist Ian Strange deconstructs buildings damaged in 2011 earthquake in suburbs of Christ's Church, New Zealand. This piece is titled "untitled house 3". 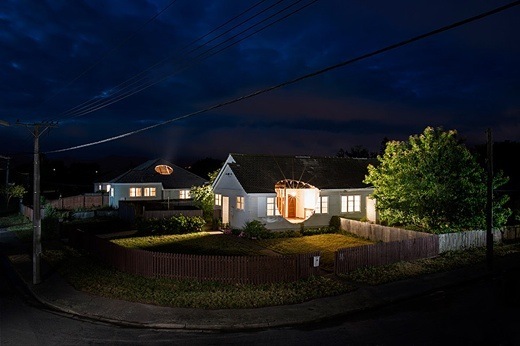 From (https://www.designboom.com/art/ian-strange-deconstructs-homes-in-christchurch-for-final-act-01-24-2014/gallery/image/ian-strange-final-act-designboom-11/). After four years of farming vegetables in the foothills of Northern California, my partner, our nine-month-old daughter, and I left our farm for a salaried job and a rented house in Austin, Texas. My first morning in the city I surveyed our backyard—a garage-sized rectangle thick with chickweed, an unruly patch of cactus, three leafless trees—then headed to the store to stock our empty kitchen. In the produce section, I floundered in choice. Accustomed to constructing meals with vegetables from our farm, I circled pyramids of tomatoes, stacks of cauliflower. I lifted a bundle of kale, but the leaves were floppy and yellowed. I reached instead for broccoli, the stalk a shade closer to white than green, the flowers dry. At the checkout line stood a rack of seeds. I slipped two packets into my cart: Georgia Collards and Ruby Red Chard. That night, I hardly slept. Though my daughter had slept fine at the farm, in Austin she woke every few hours. Night after night, in the dark that wasn’t dark at all but aglow with the light of street lamps, I rocked her, rubbed her back, murmured lullabies. Separation anxiety, I read, often caused sleep trouble in babies my daughter’s age as they developed “object permanence”—the understanding that things continue to exist even when they can’t be observed. When my daughter woke to find herself alone, the theory explained, she was less content to fall back asleep because she now understood that something was missing; something she loved existed out in the world but she couldn’t see it, couldn’t touch it. A friend suggested I place a piece of my clothing in the crib. “Sometimes the mother’s scent can be enough comfort,” she said. I unwound a shawl from my neck and spread it across my daughter’s mattress. Our rented house was nice in ways I wasn’t used to: it had good insulation, double-paned windows, a dishwasher. No rats hid in the walls, no hornets under the eaves. There was also no woodstove. Instead of building a fire each morning, I turned on the heater with my iPhone. Without produce to harvest or eggs to collect, without kindling to cut or rows of lavender to prune, I began to feel like just a guest in this life, wandering the grounds of some hotel. I felt severed from the world, as though I were wilting—I felt like the store-bought-broccoli version of myself. A month passed and my seedlings began to outgrow their pots. I set my daughter on a quilt in the backyard and started to dig, forming long mounded beds. I dug all afternoon, cultivating as much of the yard as I could, not sure what I’d do when there was no space left to dig. That evening, a siren neared and I waited for the sound to wake my daughter. The ambulance came within a block, but she didn’t stir. I tiptoed to her crib, leaned in to feel her breath on my cheek, and suddenly I wished she’d cry. Brake lights poured through the curtains, and in the murky light I realized my fear wasn’t that city life would continue to grate, to feel foreign. I wasn’t afraid that my family and I would never feel comfortable in Austin but that—soon enough—we would. It’s been two months now and my daughter, at last, sleeps all night. I wonder if her separation anxiety is abating. Perhaps she’s learning how to be apart from the things she loves, how to trust in their return. In our backyard, my seedlings grow. I spend an afternoon weeding, working my fingers through each row until the soil settles deep into the creases of my palms. That night in bed, I brush a lock of hair from my face and catch the scent of the garden still on my fingertips: tang of grass, musk of loam. I cup my face in my palm, press my nose into the skin, and fall asleep. The myth of "White Safety"